Established nearly ten years ago as the pinnacle of modern animation, Pixar keeps reaffirming its lofty status with every new release, and The Incredibles is no exception. This remarkably entertaining and meaty motion picture is all eye candy and goofy entertainment for children, but underneath lies a biting denunciation on a number of contemporary topics, such as frivolous lawsuits, among others. Writer/director Brad Bird tackled Cold War fears with his amazing The Iron Giant, and he proves here that he's a sly commentator as well as animator and storyteller. The world in The Incredibles is one inhabited by superheroes of varying abilities. Lately, the populace has become fed up with their contributions, which usually result in expensive reconstruction of private and public property. When Mr. Incredible stops a train from falling off its destroyed tracks, the passengers sue over bodily injuries sustained from the rescue. The ingratitude they show isn't all that ridiculous. If there's a way to get money out of a situation, some people will exploit the opportunity, and lawyers are too eager to help. How else to explain a recent insane lawsuit against PayPal, or the lady suing McDonald's because the coffee was too hot? In this film, a man sues Mr. Incredible because he saved his life, which is something he didn't ask for. "It has the same jokey feel of previous Pixar films, but it's probably the most mature work ever to come from the studio . . ."
The Incredibles has the same jokey feel of previous Pixar films, but it's probably the most mature work ever to come from the studio. Combining Brad Bird's vision with Pixar's animation was a stroke of genius. Doing so had the one-two punch of a high-quality script and superior animation. Though the film is loaded with subtext, what comes through the most is the excitement factor, and on that level the movie delivers splendidly. 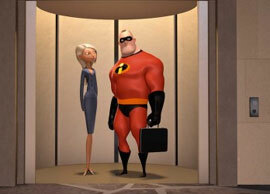 Read more about The Incredibles (plot summary, trivia, photo gallery, article and more).